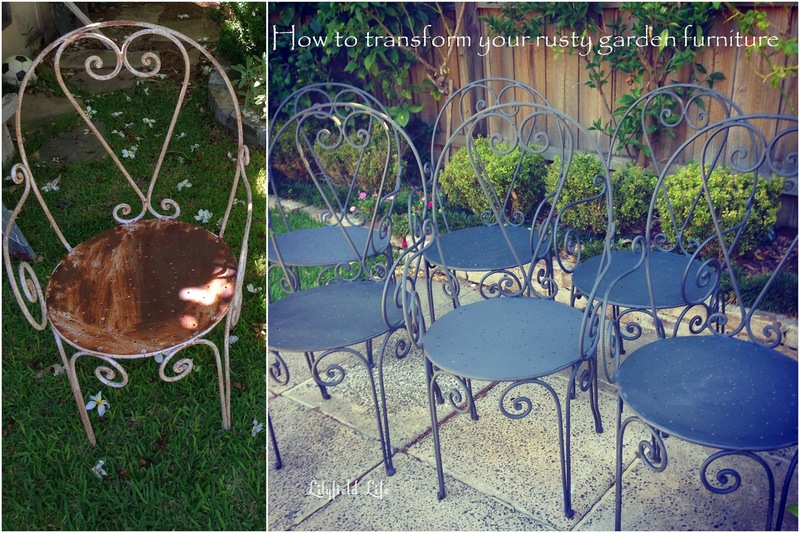 I was recently asked by a neighbour to paint her garden chairs. Marg has beautiful taste and furniture and these chairs certainly no exception. They had just seen better days. They were completely rusty so I removed (converted) the rust as per this post. The chair on the left in the photo below has rust converter on the left half and untouched on the right side and the chair on the right has been treated for rust and looks a whole lot better and ready for painting. We then spray primed the chairs with black rust converter primer - just to be on the safe side and it also was a good basis over the white metal for our ASCP Graphite paint. We then hand painted each chair and with all these metal curves it was time consuming and tedious. Next time I will just advise my clients that I am using spray paint. Over the Annie Sloan Chalk Paint (colour graphite) we the top coated with a rub on poly. It made the chairs look like hand forged metal. I really love how they turned out. I had so many people asking me if these chairs were for sale. I occasionally see them for sale, and even their original rusted state they can sell for $300-400 each. I would say if you see them cheaper than that, nab them! The rust is easy to deal with. Marg has a beautiful marble table that the chairs go with. and she has a beautiful grown family and gorgeous grandchildren who all gather for Sunday dinners. A beautiful tradition. I like to think of them using these chairs I have restored for them. Thanks so much for sharing this method Fiona. I have a rusty table that I want to paint but I wasn't sure how to go about it. The chairs turned out beautifully. These smaller than normal trees can be become both all around relying upon their size and accommodates both an intriguing leisure activity and a tasteful outcome.